Top10 Escape from Haunted House is another point & click escape game developed by Top10NewGames. 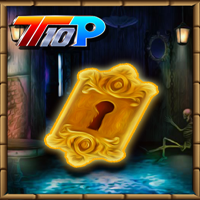 Assume that you are trapped in a haunted house and your aim is now to escape from there by using a key, objects and hints to solve all puzzles at this place. Are you able to get out of this haunted house? Good luck and have fun! What has happened to the game menu page of escapegames.com?? What I see now puts me totally off playing here. Everything is dark, craves lots of scrolling and easiness of finding a game to play has disappeared. It´s plain terrible tbh. Has escapegames.com been hijakcked? No. Not hacked, clawed by an evil cat with links to halloween mischief. We are working to restore everything but eg24 is a huge site and loading the back ups take a long time. I'm really sorry for this but rest assured, all will be returned to normal asap. Thank you :D You made me real happy now. hmm but all the work it puts upon you - you have my sympathy. Lets find that evil cat and cast a spell on it. Evil, wicked cat from Hades. I love her dearly but that was not a kind thing to do to me (my blood-pressure, anyway). Next time I edit anything, the cat is being locked out of the room! When she's not trying to sit on my keyboard as I try to type, she's sticking her claws into me for attention. Bad Misty!! EG24 IT messer, sorry, manager.